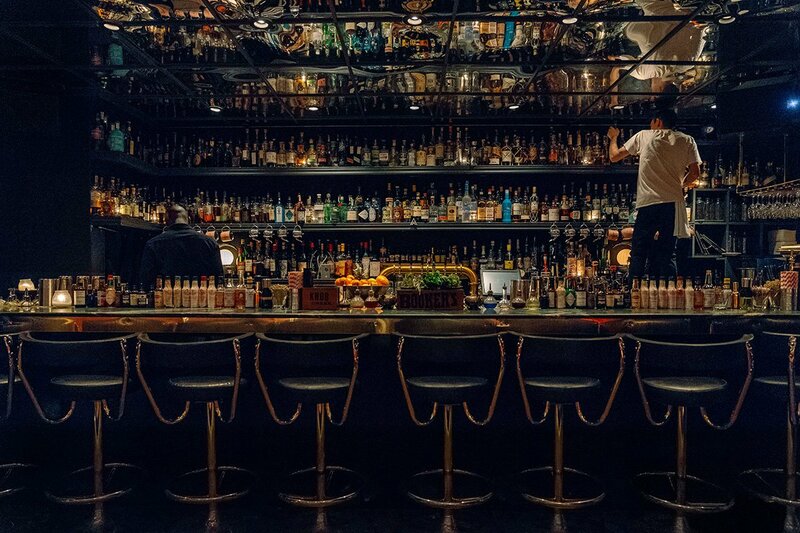 Montreal's latest happening place to drink is a cocktail bar hidden on the edge of St. Henri. Gentedimontagna editor Daniel Schwartz checks in on a recent weekend in town. MONTREAL — By now, it’s a familiar sight on the corner of Rue Notre-Dame Ouest and Avenue Atwater in Montreal’s up-and-coming St. Henri neighborhood. Couple gets out of their cab, walks up and down the street, wonders if they got dropped off at the right location, checks their phones, then disappears down a dark alley. 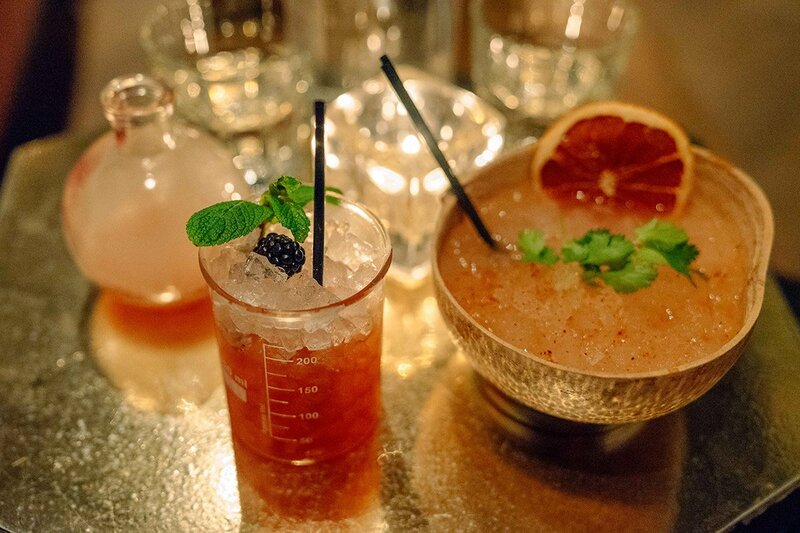 Destination: , the hidden speakeasy and darling of the after-hours industry set. The small lounge is located behind , a hip French diner with street cred. Both spots are owned by the same group, which includes Roberto Porres of Old Montreal’s and and interior designers . It was a Monday night when my girlfriend and I dropped in, the last hurrah of a long weekend before boarding a nightmarish overnight bus back to NYC. (We needed reinforcements.) That’s certainly not the bar’s most popular time slot, but, according to the staff at both and the restaurant , we couldn’t leave Montreal without a visit. We entered through a door marked by a red industrial light, walked past a mantle adorned with a T-rex skull, and found ourselves in a long room full of lush plants, flanked by coral pink leather sofas, and topped with a mirrored ceiling makes the intimate 1950s-inspired space look sleek and bigger than it actually is. The illusion probably helps on weekends, when, we're told, the space fills to the brim with a young, in-the-know crowd. Apparently, you need to get in early, otherwise it's standing room only. The Mad Scientist (left) and Mexican Donkey (right) cocktails. Right: Kung-Fu Panda and Villa Madre (tequila, chartreuse, egg white, and Lady Grey tea) cocktails. We arrived shortly after the bar opened, so we had no problem finding a seat. 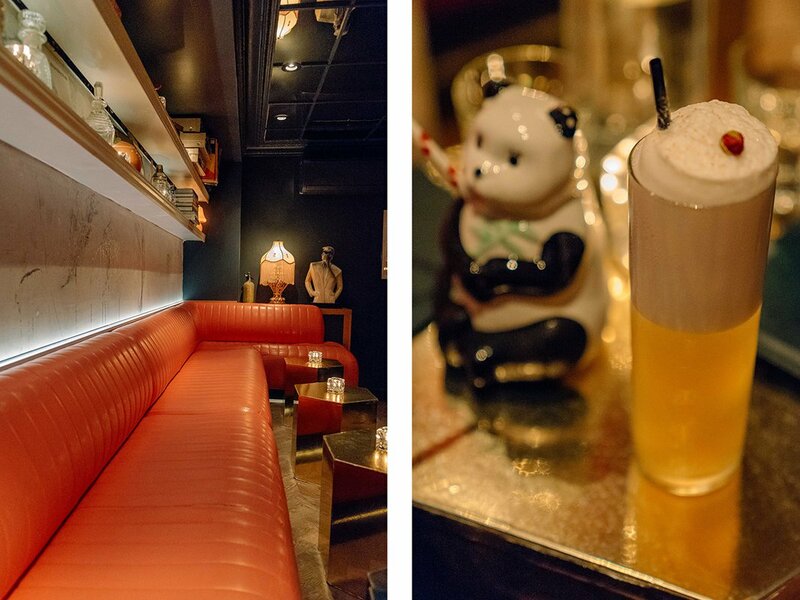 We settled on the sofa in front of the impressively stocked bar, ordered two rounds of drinks, and watched the bartenders shake us up something good. The cocktails here look as good as they taste. The Mad Scientist (tequila, raspberry, blackberry, caramel, cassis, and apricot) came with a beaker of smoke that smelled like copal incense. Mexican Donkey (mezcal, ginger beer, grapefruit, lime, and coriander) was served in a coconut. Kung-Fu Panda (rum, pear, lime, walnut bitters, and pandan leaf syrup) came in a kitschy porcelain panda cup. Talk about eye candy. The bar also serves food from Foiegwa next door, the kind of grub you usually only dream of after a few rounds of drinks — truffle pasta, steak frites, burgers topped with foie gras, and a loads of luscious-looking desserts. But we had dinner plans and did not indulge. As we geared up to leave, we eavesdropped on a pair also on their way out: Another couple from Brooklyn in Montreal for a long weekend. Coming from the city center, the bar is on the way to the airport, and this too was their last drink before heading home. We looked at each other and smirked. Seems like we weren't the only ones who had this great idea. Find the , follow of the city, and order in St. Henri.